Several of the Adventurers on our Freeform Peyote Challenge don't currently have their own blogs, so I'm hosting them here as guest posts. Tammi was one of the first people to sign up for the challenge, but contacted me two days ago to say she had to bow out. I discovered that she'd finished the piece, but her "critic said it was too big, too busy, and ugly." After talking with her, she agreed to send me a picture of her piece, and then agreed to go ahead and join in the reveal and I'm so glad she did. 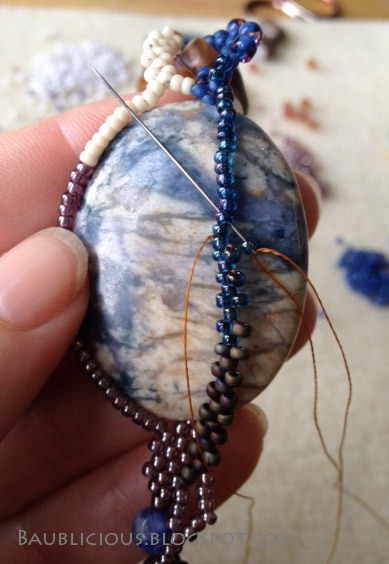 Here's Tammi Clapper talking about her first piece, a freeform peyote pendant. 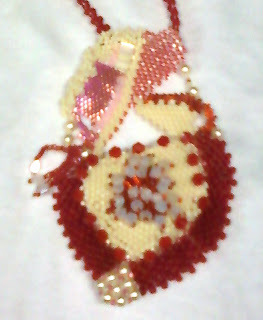 My inspiration for my piece was Valentine's Day and more importantly my love for beading and trying every type of beading pattern ever made. 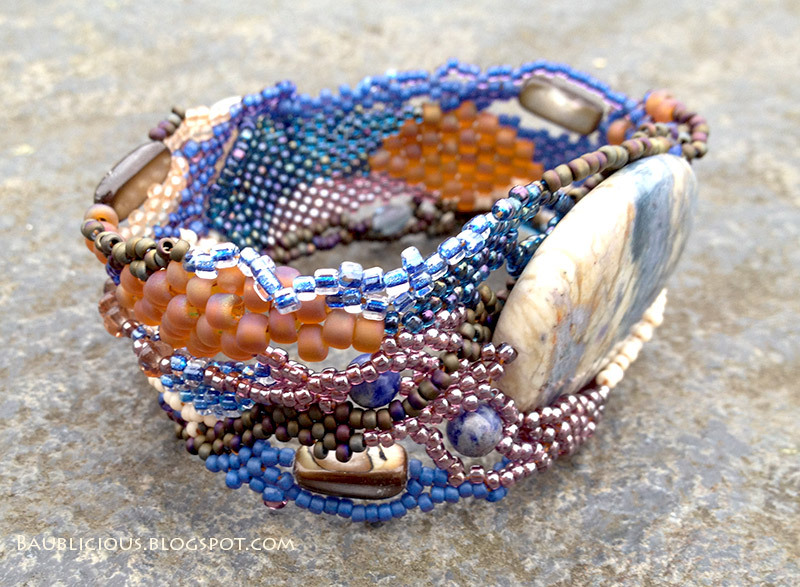 I also am hoping that by doing freeform peyote it will lead me to hopefully develop my own pattern. 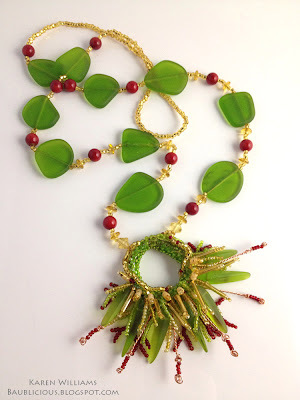 I love the colors and mixture of different size, texture and shape of beads I used to develop this first freeform masterpiece! Would I do things differently....of course there are a few things I would change, but for my first piece I think I got the general idea! This week's Focus on Life prompt is Monochrome. Color is the single most personally important element in my art work. 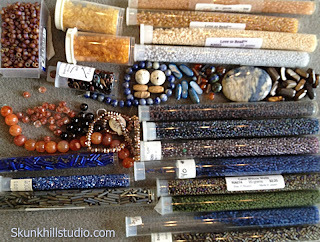 Color is what drew me to seed beads in the first place - those pure pixels of color in the form of tiny glass beads. When you take away color, you're left with value, texture and line. I found myself looking for these elements every where I went this past week. 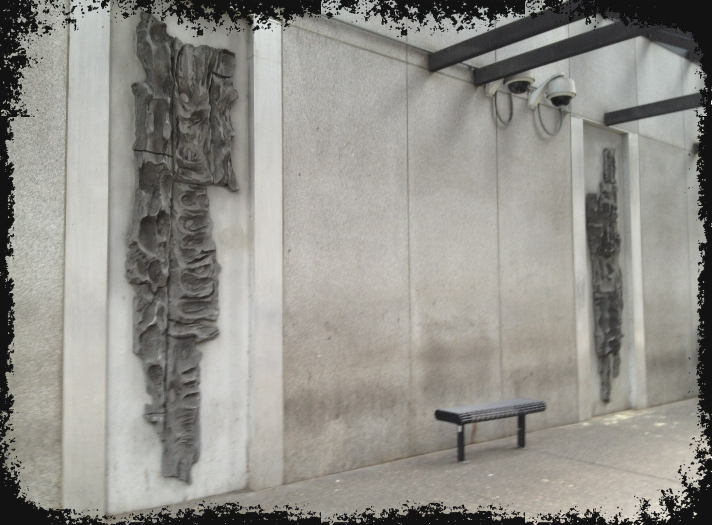 In particular, I found myself noticing all the public art work which ignores color completely, focusing on the other design elements. My favorite I've decided it this window screen on one of the parking garages downtown. I love the overlapping, concentric circles, like ripples in a pond. 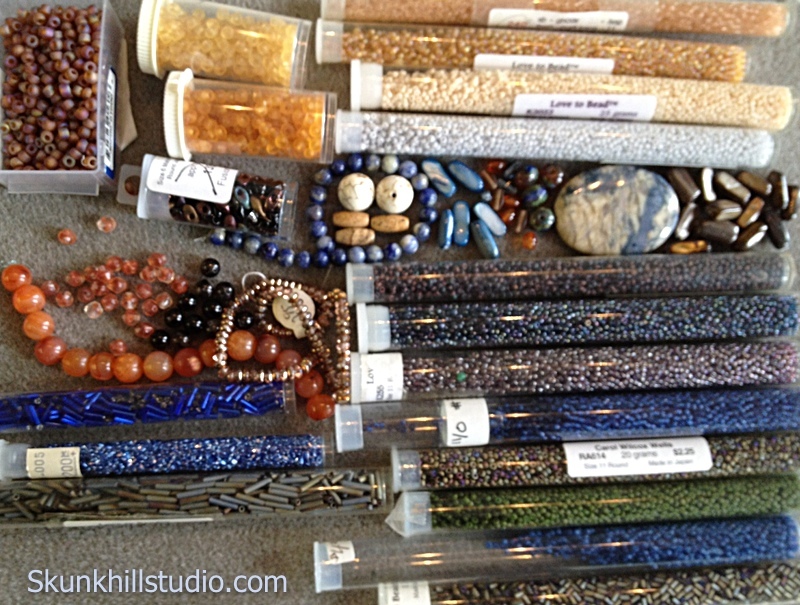 Playing with bead selection for a new bracelet. 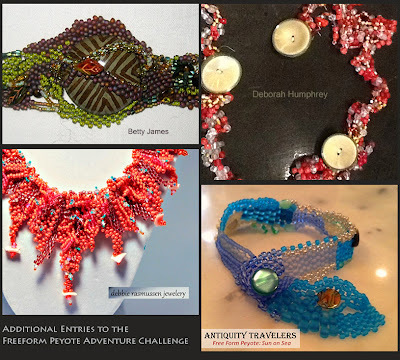 I am thrilled and amazed by the enthusiasm expressed in the still-new Freeform Peyote Facebook Group. A number of you are new to the medium and I've loved seeing your first projects! 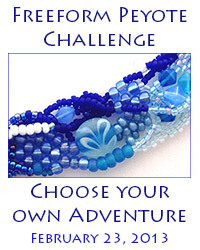 And I'm thrilled with how many of you have joined the Choose Your Own Adventure Challenge. 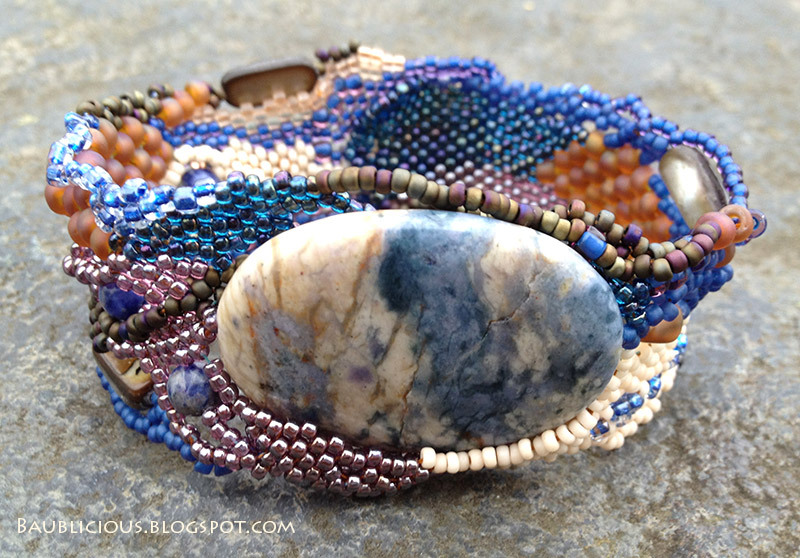 I'd originally planned to put together a series of posts on the basics of freeform peyote, but as often happens, life got in the way. Talking with my husband this morning, I wished that I'd managed to start earlier, as now that we were halfway through the challenge it's seemed a little late. He disagreed, saying that it's never too late. So I'm writing this post because he said I should. Step 1: Choose your beads and color scheme. 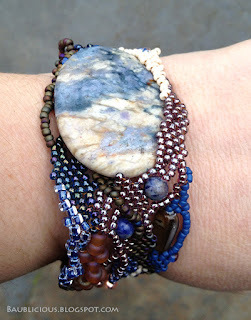 Above, I used the large stone bead in blue and cream with veins of sienna to help guide my color selection. Not all of the beads shown above will make it into the final piece, but I like having options. 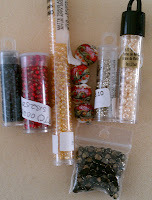 My plan here is to make a bracelet. 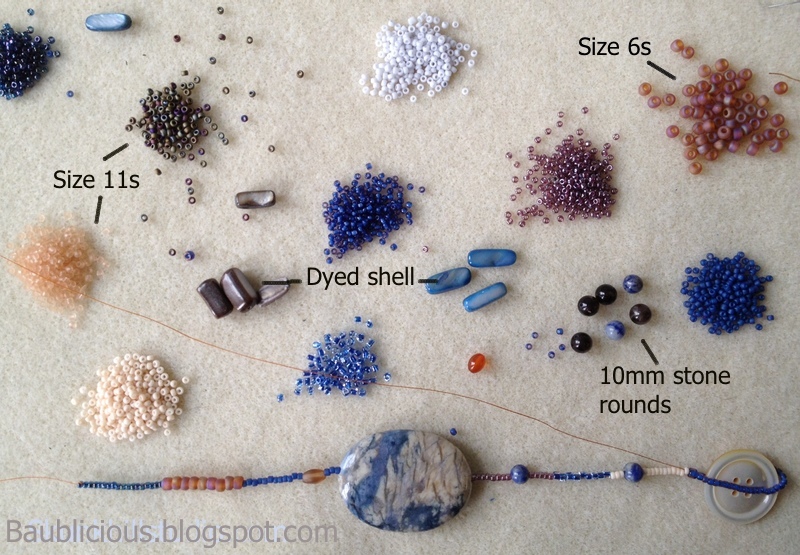 Starting out, I measured about a teaspoon each of a number of my seed beads onto my beading mat and added a few of my smaller accent beads. I then strung my initial row of beads, adding a loop that fits my button just a little bit loosely at the end. 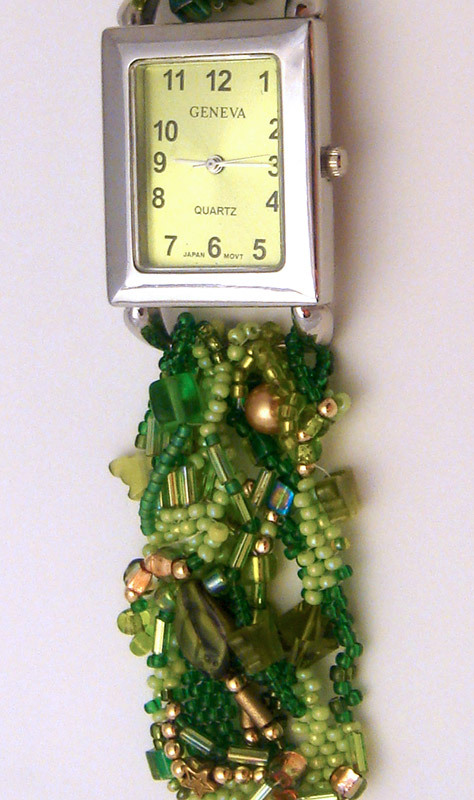 The working length here is just over eight inches. Note that I didn't try to use all of my bead types in this first pass. There will be time to add more later. 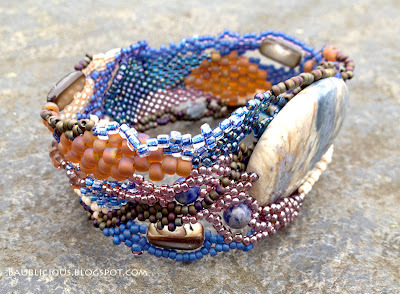 Here's the bracelet as I finished this first row of peyote stitch. Again, I simply matched bead types and colors, and stitched through the larger beads. A quick view of the turn around. 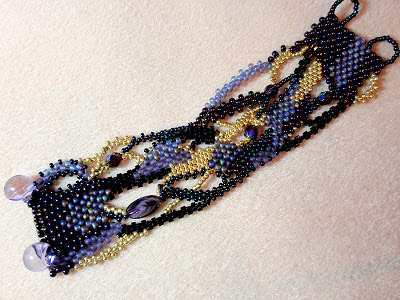 In the last pass, I added beads along the top edge, now I'll add them along the bottom, working in a circular fashion around my center line. Working both edges; first one, then the other helps keep the piece balanced and my focal bead centered. 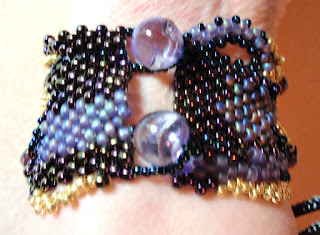 Next, I start moving colors just the slightest bit, like the size 11 seed beads just starting to encroach on the size 6s on the left hand side of my bracelet. Note that I used two size 11s to span the space of one size 6 to keep everything laying smoothly. 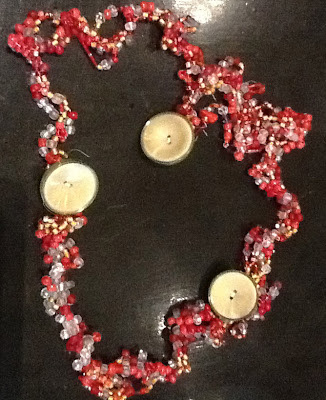 I also added bridges working around the smaller accent beads. And I peyote stitched around the bead loop. 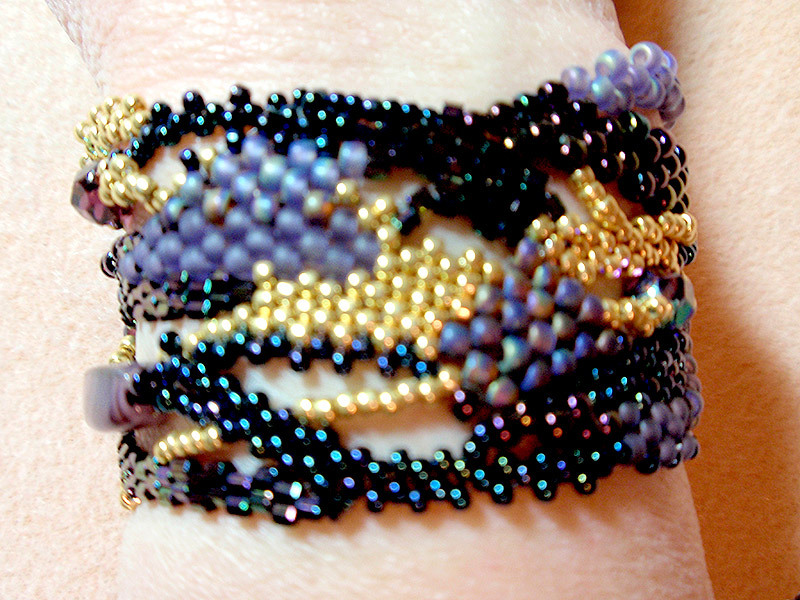 The right hand side of the bracelet has six rows of peyote stitch in the photo above. Then I ran out of beading thread, so I wove both thread ends into the body of my work (removing the stop bead from my starting end) and took the picture. Between the previous picture and the one above, I focused most of my attention on the left hand side of the bracelet. Continuing to build my initial blocks color, I dragged one color into the next over several rows. This is my preferred method of changing colors as I think it gives a more natural, organic flow to the piece, but that's totally an aesthetic choice. If you like hard edges between color blocks, go for it. (That style often reminds me of Gee's Bend quilts). 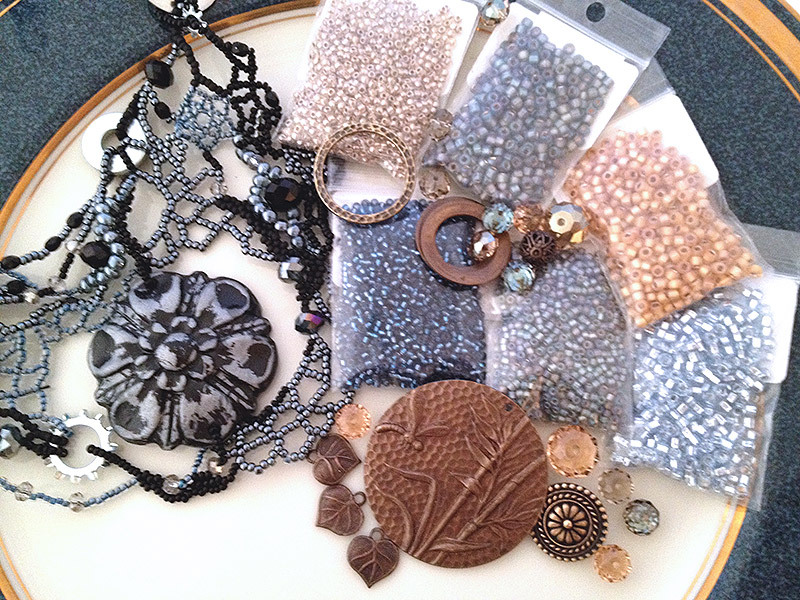 Middle left, I introduced a new block of cream as a shorter bridge around an accent bead, then used it as part of the longer bridge around the top edge of my focal, changing to antique bronze a third of the way. 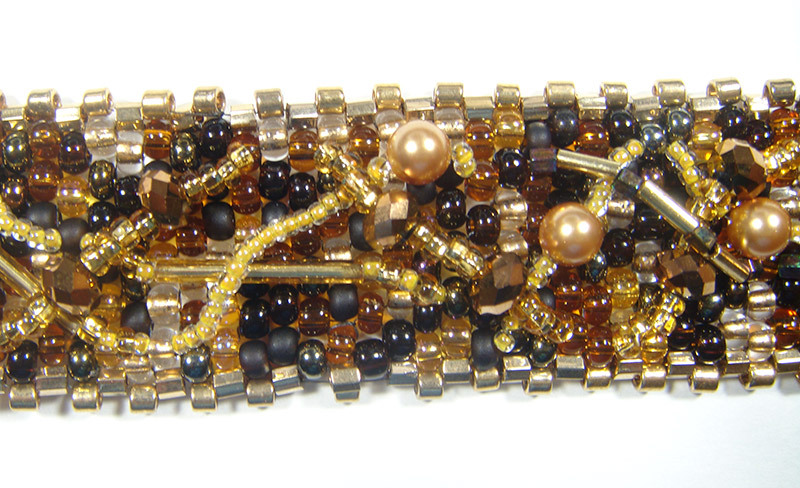 I also turned the inner right bridge into a twist, anchoring the twist in place by stitching along the new edge. And in the lower left I added a bridge of blue matte seed beads and one of the dyed shell accent beads. At this point, the initial color blocks are well established, and it's simply time to continue building along both the top and bottom edge. 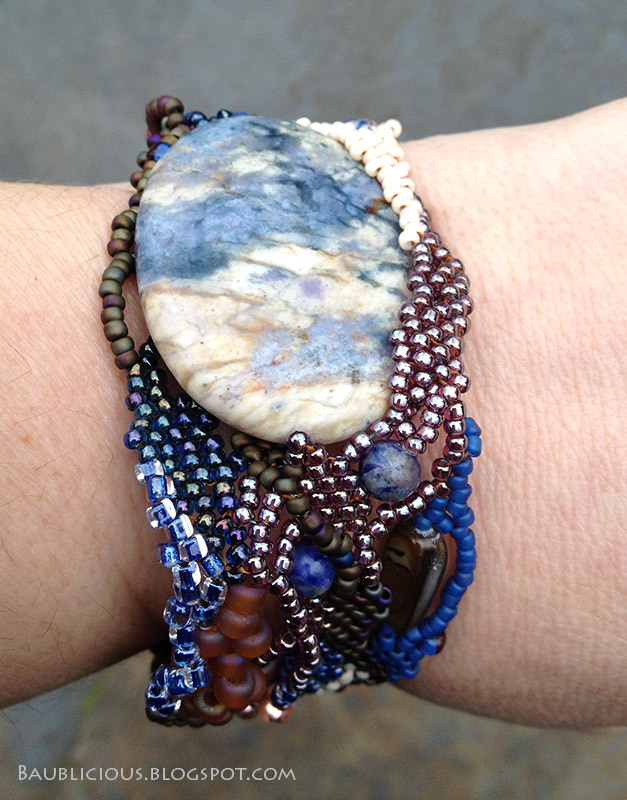 My plan is to continue this show and tell next week, with additional pictures of how this bracelet develops. I'd love to hear what you think - was this useful? 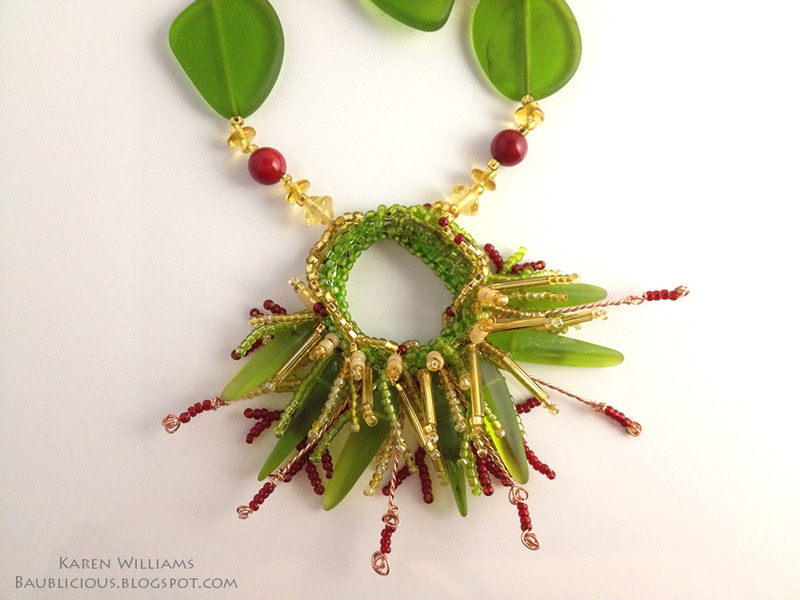 Last week I shared a process photo of my Sea Grass pendant in this post. 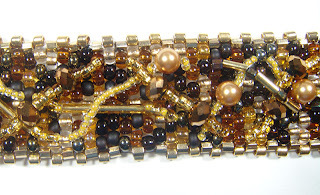 The fringe is nice and stiff and sticks out in an arch around the lower half of the beaded circle. I was inspired by the wonderful cultured sea glass shards sent to me by ZnetShows (it's been fun watching them set up their booth at Tuscon) and a photo of Button Sedge from the book Archipelageo: Portraits of Life in the World's Most Remote Island Sanctuary. 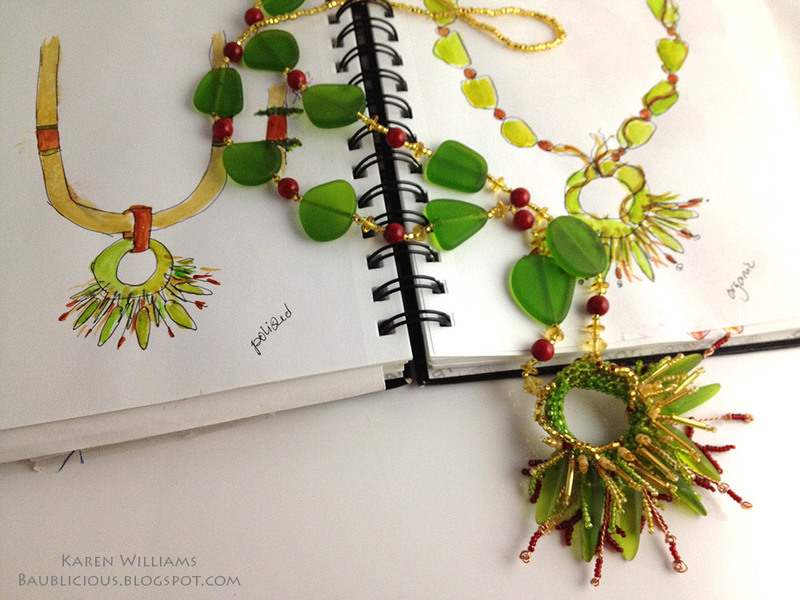 Once I finished the pendant, I broke out my sketchbook and started playing with different ideas to turn it into a necklace. 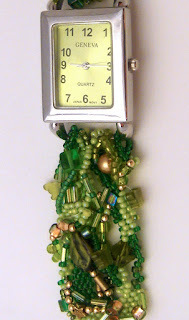 Did I want a polished look with a beaded rope, or a more organic finish working with more of ZnetShow's sea glass beads? 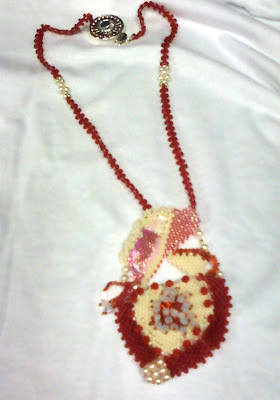 I added some dyed red stones as accents, echoing the deep red seed beads in the fringed pendant.